Safecraft Safety Equipment is used by most of the top professionals in motorsports, automotive, aviation, marine and other demanding industries. We are known for our innovative designs and our products are engineered with the highest quality components available. 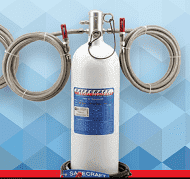 Safecraft is the largest manufacturer of vehicle fire suppression systems in the United States and the most trusted name in motorsports for over 20 years. Our systems are installed in over 25,000 NASCAR, NHRA, SCCA Off-Road and NASA vehicles and our extinguishing agents are approved to SFI 17.1, the industry standard for the quality assurance of specialty performance and racing equipment. Whether you prefer a manual, automatic or manual & automatic system, the same quality, innovation and design race professionals rely on is also used for Safecraft Fire Suppression Systems customized for marine craft, aircraft, machine tool and industrial vehicles.